Facebook messenger has emerged as the one of the most used and popular Android application which has made the communication process much easier than before. It is a perfect platform to let you get in touch with your friends, family members, colleagues, lover once and more. It can be said that people can’t stop using Facebook messenger. Now it has turned as an important application in the work environment and is used to communicate important work-related messages. 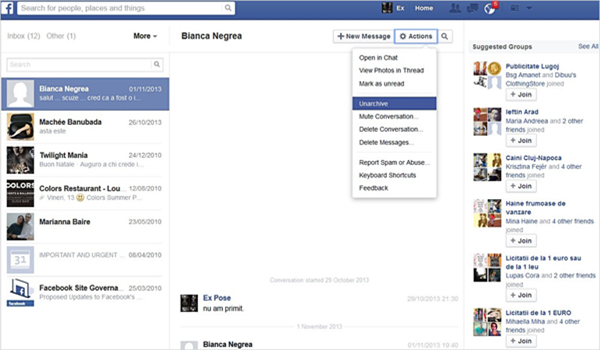 Is it Possible to Recover Deleted Facebook Messages? Most of us prefer to communicate through Facebook, the world’s largest and popular social media platform. It has enabled a faster communication process with easy connectivity. All you need is a smartphone with an internet connection to access this service. Through this, you do lots of conversations with your friends, and those messages are very important to you. Some messages are too special to be deleted. So, losing such messages from your Facebook can be very frustrating, and you can feel irritated about this. 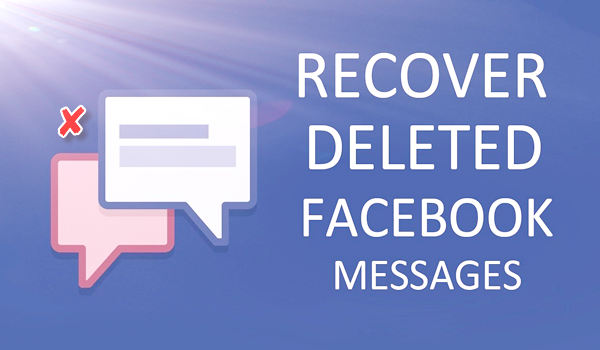 Fortunately, with a little bit of work, it is possible to recover deleted Facebook messages on your Android phone. Yes, it doesn’t matter if you have deleted Facebook messages from the Messenger app, you can still have access to those lost messages. But you can face a situation where you find yourself mistakenly deleted some important messages from your Facebook chat. In such situation you not only will lose special or memorable messages with your loved ones but also will lose all your important work details. Wonder how to quickly recover deleted Facebook messages on Android? Well, here are three methods for you. Recommended Tips: In addition to retrieve deleted Facebook messages, it’s also possible to recover deleted text messages, contacts, call logs, photos, videos, music, WhatsApp and Viber conversations from Android Phone or tablet with iReparo for Android data recovery software. First, open the Play Store app on your Android smartphone and download any file explorer app and install it on your device. You can use ES file explorer as it is very easy to use. After installing the app, open the file explorer. Then go to the internal storage or the SD storage section. You will find a folder named Android. This folder carries all the application data. Now enter into the folder, and you will see the data folder. Open that. When you open the data folder, you will see folders related to all the applications you have installed in your smartphone. 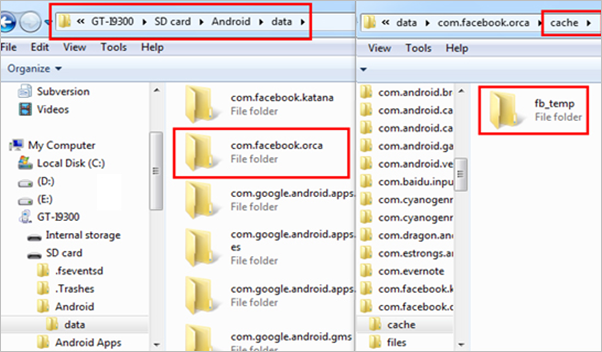 From those, choose the folder named with com.facebook.orca. This folder carries all the data related to Facebook. Open that folder. Inside that, you will get the cache folder, tap on that. Then you will see a fb_temp folder which carries the backup files, saved automatically by Facebook messenger. Connect your Android phone to your computer using a data cable. Now open the device and go to the SDD card section. Open Android and then go to data. Tap on com.facebook.orca, then move to cache folder where you will find the fb_temp folder. First open your Facebook account by visiting Facebook’s official website. After logging in, move to settings option which will be there on the upper right corner of the page. Go to General Account Settings. 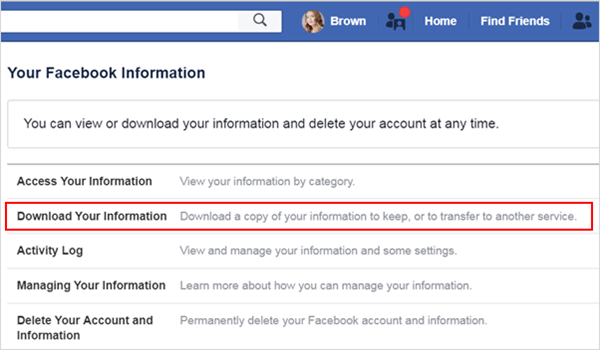 There you will find a link showing Download a copy of your Facebook data. Click on that link. Now click on Start My Archive option. Click on more if you want to know about what data will be there in the archive. A screen will pop up asking your Facebook account password. Input your account password there. Immediate after that you will get a notification showing an email has been sent to your Facebook mailbox. Go to the mailbox and find that link. Click on the link to start to download the archive. It will be saved on the PC’s hard disk. After opening the zip file, you will find the folder with some HTML files. There you will see an HTML file labeled as Messages. Open that to read your old messages. It may be noted that this file will help you in even of data loss. But if you have downloaded that file after deletion of the messages, you will not find those messages here. Launch the Facebook messenger app on your device. Long press on the conversation which you want to archive, then click on the archive. Open the Facebook app and in the search bar type the person name. The archived conversation will appear on display. Or visit the Facebook webpage, then go to messages. Click on More, then click on Archived. Move your mouse over the archived contact and click the arrow mark in the lower right corner to cancel the archive. These are some useful steps to get back your deleted Facebook messages. But to avoid such situation remember to take a backup of your conversation frequently. By the way, if you find this article valuable, please share it with your friends and friends; if you have good methods or suggestions, please leave a comment below. Thanks for your time.